Sunny skies, a slight westerly breeze, and flat seas were the order of the day here at Langara. I see five tyees on the fish board, as we start a new trip with eager guests and guides. 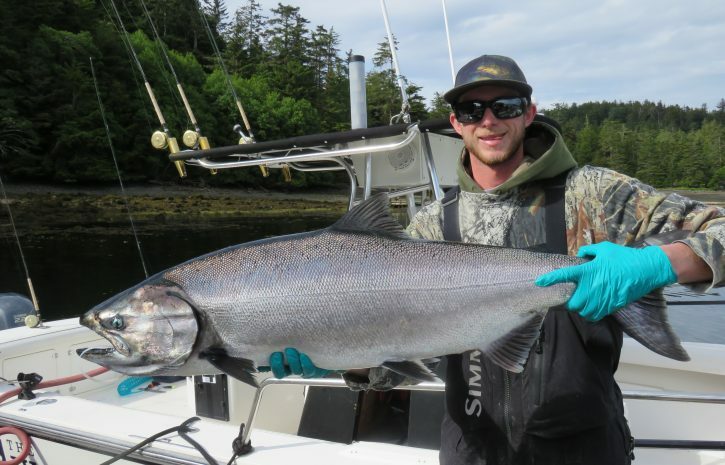 Moh Faris had the lunker of the day at 39 lbs, fishing with Dunne. This fish was off the slide, Dunne commenting he was sitting on balls of bait all afternoon. These balls were showing yellow orange on the sounder, indicating herring, lots of them too. Herring run denser than the needlefish, which show on the sounder as gray or blue balls. Yes the bait is at times thick on the Gunia tack, and the trollers are working the tack down to Boulder with good results. Conman and his guests Neil and Riad had a tyee too, Conman was pumping his fist and high fiving his guests at the scale while several of us stood by observing. 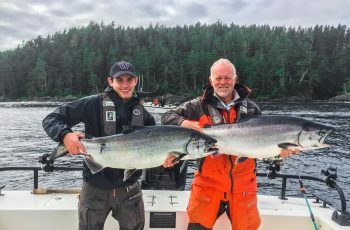 Korey found tyee as well, fishing with the Schneiders, grabbing a couple on the tack. Nice too see Jack Gucker on the famous tack fishing with Todd, They were on fish most of the afternoon. I was angling with Mark Zivot and Doug Porozni and we fished the tack hard, dodging boats all afternoon. We did hook two monsters, both knee knocking Hippas, but the Hippas won again, notta, so tomorrow we have some work to do. These are powerful fish, and once in awhile they prove it, an amazing thing to play one though, keeps you out there. 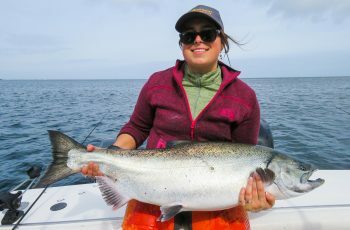 We now have a couple boats scouting around, Wilson headed to Lacy for his biggie of the year yesterday, coming in at 39. 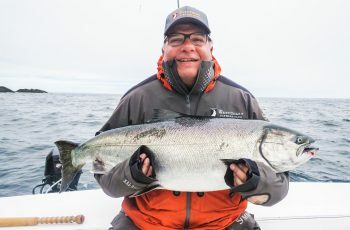 Wilson fished Coho today and grabbed some kings, yes Coho Point is alive! I heard one of our self guides snuck a 55 ling in, wow, that is a sight. I see these monsters underwater and they do look menacing, but are actually very friendly and docile in my experience. The lings for eating are ten to twenty lbs ideally. Chutters battled a rock dog…angry sea lion and lost his net and a nice fish. What a drag, always be ready for the old reach around, these Lions are fierce this year. 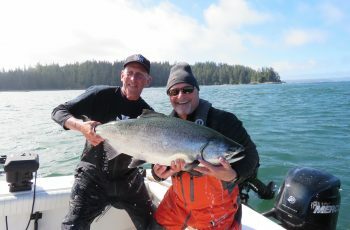 The guides saw Ed’s net skipping into Boulder Bay with a 1500 lber attached, thankfully Chutters has all his limbs intact. Korey had a rod and reel stolen today by a lion, headed to the kelp with it. Time to go diving and pick up the carnage. Fishing and weather look good for tomorrow, so we will have a report for you as soon as the first Hippa is released. Great to hear that the fishing is so good. 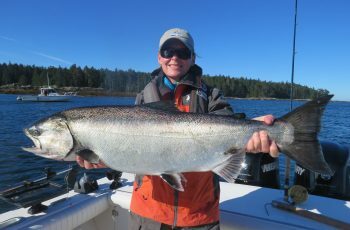 Our money is on Mom (Deborah Lamoureux) to bring in the big one this trip. Have a good one! Tim, Sarah, Zach and Jasper – back home in Calgary!